My favourite days at work have many ingredients. It takes no less that the first half hour to fire up the computer. Which then promptly crashes leaving me helpless and hormonal. I proceed to get barked at by colleague/ supplier/ journalist. And finally face an impossible client deadline that likens the plot of Mission Impossible to an urgent trip to the cornershop. The 5-10 ingredients that add up to an Indian recipe are a far cry from all this. So they smell. Are well fiddly. And require some planning. But boy do they make up for working day misery as well as a stiff drink and trash TV. Not so idiotic now, is it? When cooking yogurt, I strongly advocate using the thick, full fat variety. We call it Greek Yogurt here, but it’s made from cow’s milk. Even on a high flame, this stuff does not split and gives a delicious richness to dishes. Any oil that escapes it, you can simply leave behind in the pan when you eat. The low fat, natural variety works best for things like Raita or Lassi. I’ve tried mixing flour/cornflour into it and straining to thicken further – but it still curdles the minute it touches the high heat that’s a must for quick cooking. Here is Zafrani gosht, a simple, tender saffron goat meat curry to get you thinking differently about this wonderful ingredient. 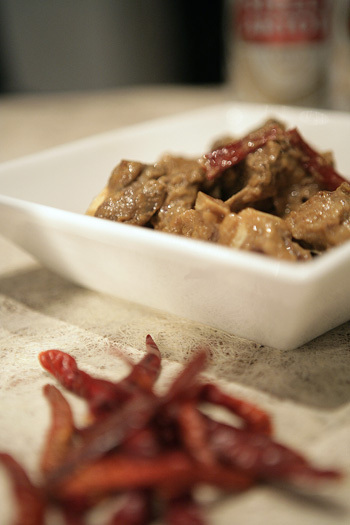 You could also substitute the goat meat with chunks of lamb, bones included. Finely chop or puree the ginger and garlic. Slice the onions. In a large pan, heat the oil until very hot. Add the whole spices and as they sizzle, mix in the sliced onions. Fry the onions over the high flame for five minutes until they turn a pale golden brown. Then stir in the ginger and garlic and fry for another five minutes until the masala transforms to a darker shade of gold. Now add the coriander powder, yogurt and meat and stir like a maniac, until it is well sealed all over. Add a cup of hot water – enough to submerge the meat – and cook covered on a high flame for about 45 minutes. You will need to keep stirring to prevent the meat from burning or sticking to the bottom of the pan. If this happens, you just need to add more hot water. If you’re the proud owner of a pressure cooker, by all means use it. But the taste of this delicate curry, comes from the cooking time. When the goat meat is tender and starts falling away from the bone, mix in the saffron strands and salt, simmer for a minute and serve piping hot with some Naan, and as in my case, premium beer. Ps = This is my entry to the fantastic competition being organised by Maninas. I have my toes and fingers crossed. You’re right about yogurt’s benefits for our healths. I make my own yogurt and usually by the time I make an Indian curry, I am out of yogurt. Milk’s a good replacement but definitely not the same without yogurt. This inspires me – it is worth another go with yogurt. I am always worried how long to cook it for fear of making the dish go watery. Or does the water evaporate, eventually? Maybe the secret is, as you say, to use the thick creamy Greek one. 1. Your galouti kebabs. Can I fry them, cool and then freeze? Once frozen do I defrost or just heat in micro from frozen? 2. Chicken or meat curry with dahi in it, can I freeze? 3. Any suggestions for Indian food that freezes well? Hi 30 in 2005 – the only thing that doesn’t freeze well is rice and cooked potatoes. Otherwise stick the whole lot in – curry and dal are particular freezer here’s-one-I-made-earlier favourites of mine. Your other half is one lucky pizza lover. I do the same thing for my man – such a spoilt brat… Good luck! I definitely need to incorporate more yogurt into my cooking. I use it for baking and sometimes for marinades, but I forget about using it as a base for curries. Onto a piece of paper, out of a pyrex bowl, and onto our laptop screens… Guess whose was the first name that my husband drew this morning for the One Perfect Ingredient compeition? 😀 YOURS! Congrats, you’ve won the book!!! Hi Mallika…got here from Maninas. First of all congrats…you won the book!! Good for you!! My first time on your blog, & I love it! Will keep coming back. The zafrani lamb is on my list of next lamb to try!! Thanks you & cheers.